Physics students learn how the laws of nature can be used to explain the many phenomena of our world. Most students are excited to find that elementary principles, many of which are learned in introductory physics courses, may be used to solve seemingly complex problems. This ability to apply the simple principles that underlie complex problems will serve students well in the interests and careers they pursue after graduation. 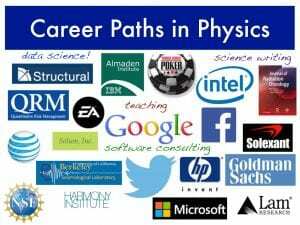 What career opportunities are there for physics majors? A solid grounding in the liberal arts, which includes good communication skills, both written and oral, is an asset sought by most employers. Graduates with a major in physics find employment in the various areas of physics and other physical sciences; in technological and health industries; in financial services; and in computer science, library science, education, communication, law, and medicine. In some of these areas advanced study may be necessary.Many students who earn a bachelor’s degree in physics continue their studies towards a graduate degree in physics or a related field of natural science or engineering. Students who have demonstrated their abilities with a good record in an undergraduate physics program are favorably considered for admission to professional schools. Current information about the job market for physics degree holders, see the American Institute of Physics job information site. For more information about careers in Physics, see the American Physical Society’s Careers in Physics web page. What about an engineering degree? The department coordinates a pre-engineering program in which students may complete preparatory course work before transferring into an engineering program at another school. Some students instead complete a baccalaureate in physics from the UO and gain admission to the UO Masters Industrial Internship Program (http://internship.uoregon.edu/), where students train and then undertake paid internships in technology industries, or into a master’s degree program in engineering. Click here for more information about the Engineering Prep. program. The problem-solving and analytical skills learned as a physics student will serve you well in any career you choose. My experiences in the high-energy physics laboratory were the highlight of my academic experiences at the University of Oregon. I had contact with professors and exposure to a research environment, which solidified my intentions to go to graduate school and explore my own research interests. The valuable experience I got using state-of-the-art laboratory equipment has proved useful to me in graduate school. The greatest benefit of my laboratory work was that it allowed me to learn about a wider range of subjects than my courses covered. When I first approached David Strom, an assistant professor in the Department of Physics, about doing an undergraduate thesis, I was considering going into electrical engineering in graduate school, but I was concerned about my minimal background in electronics. Dan Marks graduated Phi Beta Kappa from the university’s Clark Honors College with a major in physics. He helped me choose a thesis topic that not only taught me more about physics, but gave me the opportunity to learn more about electronics. Part of my thesis required me to construct a device to conduct measurements on low-noise amplifiers. While I have since chosen to pursue optics in graduate school, the lessons I learned working on my thesis have proved invaluable in preparing me for the work I do now. What can the University of Oregon Department of Physics offer you? The department’s faculty is committed to giving majors a solid foundation in the basics of physics and to teaching students the analytical and problem-solving skills that are essential to any career. Physics classes typically comprise fifteen to twenty-five students, an optimal size that guarantees individual attention. These courses are taught by faculty members who bring their research interests into the classroom. The thirty-four faculty members in physics have diverse research interests that range from astrophysics to materials science. The faculty is awarded more than $4 million in external research grants each year. Whenever possible, undergraduates are offered the chance to participate in vigorous faculty research programs. Willamette Hall, a spacious new facility, was designed specifically for the physics department. 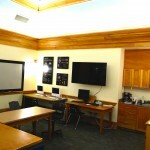 Its introductory physics laboratories are equipped with microcomputers to aid students in data acquisition and analysis. Significant funding from grants has provided up-to-date equipment for advanced laboratories in laser optics, electronics, and instrumentation. Current research areas include astronomy and astrophysics, atomic, molecular and optical physics, biophysics, chemical physics, condensed matter theory, elementary particle physics, nuclear physics, physics education research, quantum optics, solid state physics, statistical mechanics, superfluid mechanics and areas of applied physics. Interdisciplinary research is carried out in a variety of research centers and institutes. This research activity provides numerous opportunities for the participation of undergraduate students. A listing of department research areas, including faculty research interests and backgrounds is also available. 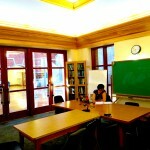 The Physics Reading Room offers a comfortable place for physics undergraduates to study and exchange ideas.